Oh noes! Wind driven global warming hot spots | Watts Up With That? This says it all: The research was partly funded by a grant from the Australian Climate Change Science Program supported by the Australian Department of Climate Change and Energy Efficiency. Sounds like yet another negative feedback. By moving the heat poleward, it’s easier to get rid of it. Not very creative in their brainstorming methods for trying to determine the drivers for these changes in currents, are they? CSIRO is a notorious Quango (Quasi Non-governmental Organization) which does not march unless the Aussie government says go! Jump? How high? If there is a partitioning of a fluid into a “hot spot” then there must be a concomitant “cold spot” of equal and opposite strength to bring us a mean. But, of course, they won’t search for the “cold spot”. I quite reading right about there. It’s the windfarms. Sucking power out of the wind in one place leads to unpredicable changes elsewhere. Must do. Should have used the precautionary principle before putting them up. However, a little grant money should point the way. Observations? Real data? Who needs them when you have computer models. Yes – that is ALL you need to know about this “study.” Research funded by “BIG CLIMATE.” Follow the money! Hot spots> are they unprecedented? woe is us..
Any previous info/affirmation on those currents that were supposedly 350 whatsits further north at some point in the past? Synchronized?, methinks Bloveld is involved here. “Detecting these changes has been hindered by limited observations” Oh noes, does that mean what I think it does? “He said the research points to the need for a long-term monitoring network of the western boundary currents.” Hey man, gotcha drift there matey. I think this goes for the cherry picking the warmers are citing with receding glaciers also. There are large glaciers that are increasing also. Having sail the Tasman many times I have sailed over an underwater volcano ( south east of Norfolk Island ) which distorted the horizon, sailing through it the water temp. changed 8c in 4/5 miles, the height of the water in the center must have been at least 20 feet higher as you could see it miles away, the depth we measured at just over 2 miles, that one hell of a lot of heat ! So is the wind pushing the ocean currents or is it the ocean currents pushing the wind? Where is the historical data? Surely this has happened before? I thought funding could only be used to indict skeptical studies. Actually, that makes it harder to get rid of. The rate of radiation loss at the poles is much lower that it is in the tropical deserts; T^4 and all that. They seem to miss the obvious. By these currents pushing closer to polar regions, they result in greater heat dissipation. 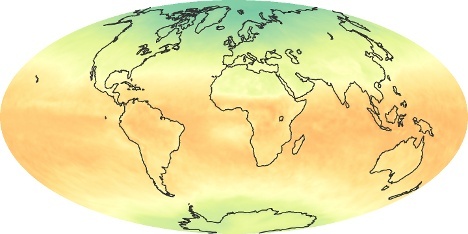 The overall result will be an increased loss of heat from the oceans. This is probably part of a natural feedback that helps to maintain the overall heat content of the oceans. Notice how the heat content in the upper 700 meters of the ocean has flattened out over the past few years. “He said the research points to the need for long-term grant funding, so he can continue to pay his mortgage and feed his children”. Well, I guess that makes it an indisputable fact. Dr. Cai said it’s so. Aha, can’t be wrong here! We have simulations. Tasmania is 2 degrees warmer?? Follow the money == confirmation bias. Anyone want to bet they didn’t even look for another cause? I guess Dr Cai knows just what he has to do to get that coveted well paid post in an IVY League University. As I keep saying, the jetstreams and the rest of the weather systems did move poleward in both hemispheres during the late 20th century. So of course there would be an effect on ocean surface circulation. The trouble is that the poleward movement stopped around 2000 and now the climate zones are drifting back equatorward again hence all the recent cold air incursions into the mid latitudes. This data is already 10 years out date. Can we give up on the friggin models and just observe, please? We need someone to make a pie chart with only two colors showing the percentage of climate scientists employed by government or receiving federal funding versus the percentage employed in the private sector. I’m guessing at least 99% versus 1% ? Getting any number of people behind a ’cause’ is relatively easy when you have …..billions of dollars to pay them to do it. I love it, it’s just sooo predictable. Firstly they make a declaration that the ocean is going to hell in a handbasket three times faster than it should be – because a computer simulation told them so. Then they casually throw in the old assertion that the fundamental cause is CO2, despite the fact that this study has nothing – absolutely NOTHING – to do with investigating the effects of CO2. I just wish these crappy scientists would stick to the facts of their own studies, instead of regurgitating the CAGW line at every opportunity. But then, that’s Big Government-funded science for you. We wouldn’t expect anything else. We didn’t notice these changes before because of limited data. We used a model to fill in the missing data, and lo and behold, we found an increase in the warming of the oceans. I would love to see the Vegas odds on anything funded by this group showing something other than Catastrophic Man Made Climate Change. Probably similar to the odds of being gored to death by a unicorn. Super computers are trying to take over the planet by fooling scientists. It’s time to get back to pen and paper! So wind driven ocean hotspots, which we think are hotter now then when we didn’t measure them, can save us from a slumbering sun? Polar air is much drier, making it easier for heat to escape. The moon is made of green cheese. My computer simulation says so. This study is a pile of crap. I’m sorry to be so crude, but really, the Climate Liars will say anything. They haven’t a clue as to whether this phenomenon is natural or not, but lo n behold, without any historical data or facts it’s all because of Global Warming. *Eye roll* The journal that published this tripe should rename themselves – The National Enquirer of Science. Yes, our computer simulation proves it!!!! Huh. The publically funded research points to the need for more publically funded research. Look at this every day and watch the “spots” hot and cold move around! I’ll take the unicorn and the points, Mike. we find that the post-1900 surface ocean warming rate over the path of these currents is two to three times faster than the global mean surface ocean warming rate. In the US, you cannot expect anything else. Big Government funding of science does not permit the scientist (crappy or otherwise) to stick to the science of their own studies. US government contracts for environmental science work frequently contain a requirement that the results be interpreted in the context of “climate change”. You’re assuming that radiation from the surface is the major cause of surface energy loss. It isn’t, it’s conduction/convection and evaporation. How often has this happened during the past 10,000 years? Is it unusual? The ABC and the australian CSIRO are funded by the Green/Labor Coalition…they ‘always’ give the right answers! NEW RULE: Computer simulations shall no longer be allowed as the basis for Climate Science articles! From now on, only empirical data shall be allowed! Thanks to Russ in Houston, Goracle, Mike Worst, Jim G., Pofarmer, and Steve M. from TN and of course, uber skeptic Bill Maher. Wind driven hot spots ?? Sail boat with young female crew ??? Globull Warming swirls aroung the UK!!! Nice photo. My children liked to jump from the cliffs into that cove, and I’ve a speared a few Latridopsis forsteri in it. Tassie was hit by a gale last night. Power outages in many towns. Mother Nature has reminded us Tassie devils that the warm breeze from the north east is not meant to last. There’s a dusting of snow on Mt Mawson. The water felt warm over the weekend; no wet suit required, but what will happen to the sea temperature after a couple of days of howling southerlies? Where are all the fish from northern waters? No snapper, just the occasional drift of blue bottles, which we see every year at this time. That warm current will be blown back to New South Wales, and I’ll have to flush out my wet suit to get rid of the spiders that took up residence in it during our warmer than average January. It would be nice if the waters around here warmed up, but the truth is the warm current does a left turn at Flinders Isalnd, and if NE winds persist the south of Tassie enjoys a few days of warmish surface water, but then the cold water from the south returns with a vengeance. I have to stop rambling. I need to call a contractor to fix a flapping piece of roof guttering. With no ‘Global Warming’ for more than a decade they must look at smaller pieces of the globe for shorter periods of time to sustain the myth that carbon dioxide causes ‘Global Warming’. I expect that in the not too distant future we will see peer-review papers about how carbon dioxide caused a 0.02 degree temperature increase in front of the entrance of a shoe store in Omaha Nebraska from 3:00 pm to 4:00 pm on June 17th in 2008. Smaller and smaller, shorter and shorter. As an earth scientist in Oz I am getting more and more disenchanted with trivial BS being put up as “climate science” these days. There are hot and cold spots that can occur in the ocean quite often. Back in 2007 on the Northern beaches of Sydney in the middle of summer there were days of ocean temps 3 to 4 C below normal with offshore pools of cold water. But what happens in the longer term? Well, we have been measuring temperatures of both the ocean and local pool water everyday since 2000. And a plot of the results (you guess it) shows an absolute flat trend in the temperature record to date. But of course I have to admit we did not use any post-normal computer model to “verify” our measurements! The warm East Australian Current comes down the East coast of Australia, past Tasmania and then across to the West coast of New Zealand and around the southern tip of NZ, bringing the Great White sharks to the beaches of Dunedin. At the following link, we have a list of major shark attacks in New Zealand. Near Dunedin, these are concentrated in the 1960’s with none later than 1971. It either got too cold for the sharks, or maybe too cold to swim! Either way, this is clear proxy proof that there was warming in this current back in the 60’s, and it doesn’t appear that that warming has yet returned. Looking at all the dates for all of NZ, there are a number of attacks between 1880 and 1920, then none till the 1960’s. There is only one attack after the 1970’s in 1990. Data goes to 1997, and I am unaware of any recent reports of increasing shark activity. Dunedin was once the most populous city in NZ, and has had a fairly stable population over time. Read – we had no real data but still were able to produce scary results thanks to our computer models which require almost no data to produce the right answers. I once asked CSIRO if Nitrogen and Oxygen in the atmosphere became heated and emitted IR and, if so, wouldn’t the amount of IR from ~98% of the atmosphere reduce the GHG contribution to mere trace levels – insignificant ? The rest went on to ignore my request do N2 and O2 absorb heat in any form and emit IR – of course the only heating mrchanism in the atmosphere is radiation and the only gases which absorb heat are GHGs while the rest of the atmosphere apparently remains stony cold – funny we can’t observe that though. Australian scientists plan to deploy a series of moored ocean sensors across the East Australian Current to observe change season-to-season and year-to-year. more of our tax money being wasted! Doesn’t a La Nina push Pacific Ocean heat into the Coral Sea which would be sucked down into the East Australian Current? Oh, and isn’t the cause of La Nina increased east-west jetstream? I smell a lot of BS (and I don’t mean Bad Science). Ah! the once were great CSIRO. It is many years since this organisation did anything that affected anything real. They just huddle around the coffee machine discussing the impacts of global warming and what hand out the government will give them this year. But convection trumps radiation every time. That is why holding your hand over a ‘radiator’ makes it much warmer than holding it in front of the radiator. At the poles, the cold air will allow the warmed air to rise more rapidly, thus cooling the planet faster, methinks. There is so much we do not know, and so many assumptions made. I love the idea that a ‘newly’ discovered (read: not noticed before) current is not only caused by Global Warming, it is indeed going to cause more Global Warming! Talk about self-reinforcement! The climate must be so terribly unstable that it swings from -50C to +50C all the time! Surely does, and we evil humans are making it ‘tip’ once again …. Dolts is too polite a word for these guys. Ummm, no…Australian science invented Wifi for one. All the usual alarmist proclamations rolled into one tidy little press release. If anybody wants to find the cool spot, look no further than Sydney. These last two months have averaged about 23C max, and the historical average is 26C. Sure nights have been a bit warmer because of the clouds (also causing daytime cooling) but not much. I am still being told it is the warmest summer evah! Dang, my pool has not even warmed enough for my taste, and summer is nearly over! Yesterday and today are a brief warming period in an otherwise cool summer. The wicked warmists love to trumpet the myth that “big oil” is financing climate scepticism. I hope that Frank’s expression will gain currency. These big bucks have corrupted climatography. Well you never know it could work and at the very least it would keep them away from all other intelligent life forms. Aaaaargh! We’re being attacked by ocaen hotspots! What about the undersea volcanic activity. Have they never even heard of this? there are vents in numerous spots in the ocean that we know about pumping out 750F water continuously. many more have been discovered the last few years. maybe some new ones opened up in the area of concern.It would be nice if these idiots would stop fudging their false computer models and go and take a look for a change, but then they would find a real answer and reason..no, better yet, let them stay in the office where they belong. Ignorance is bliss. Ooops, that breaks it. I now do not believe that they found what they claim. They have drunk the Kool Aid and assume CO2 drives climate. The East Australian Current is wind driven [but opposite direction to the wind] and when the wind reverses with the reverse monsoon, the temperature and direction also reverse. If you check the sailor’s pilot charts, that happens for a fair proportion of the year. The scammers must be using the ocean this month for the answer to ‘What is Global Warming?’, it’ll be acid in the oceans next month. Wind blowing over the oceans will increase evaporation with wind strength but evaporation requires heat, the old latent heat of evaporation, which will cool the water/air interface. Sun dims in UV band as it goes sleepy. Lower UV lets Stratosphere / Tropospheric top lower (air column gets shorter). This causes more active polar vortex. From that we get both a ‘loopy jet stream’ in the N. Hemisphere (and our more variable weather, rather like it was in the 1950’s) and, for the S. Hemisphere, a faster Circumpolar Current from higher wind speeds. On the OTHER side of Drake Passage, the slightly faster ‘jet’ through the gap speeds up the gyre in the South Atlantic. Same effect. West coasts get cool shot, east coasts get warmer water flowing past a bit more. Over time this moves more warm water toward the poles. Per the poles not being where the heat leaves due to IR 4th power: At the poles, the water content of the air is much less. Two things happen. IR leaves through the water window. The added warm water is stormier on the way to there and dumps more heat at altitude via convection / condensation / precipitation. Net more heat leaves. If you look at a graph of net energy flux, all the ‘leaving’ net is done at the poles. At the Equator (and near it) is net gain.